Coming out can make the classroom into a space of radical imagination, rather than one which supports the status quo. Last semester I student-taught in a third grade classroom at a small, public elementary school near my university in CT. 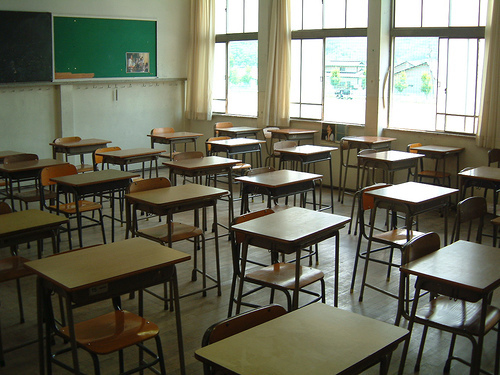 Though the reinforcement of racial redistricting codes had recently shaken up the local school system in attempts to desegregate the student population, this particular school still remained near 80% Latino, Black and Asian, and maintained similar statistics for the amount of students who were from poor and working-class households. Despite an energetic principle, dedicated and thoughtful teachers, and the fact that by state standards the school was one of the highest performing in the district, many wealthy and white families (including some staff and faculty from my university) had refused to send their kids there, resisting the redistricting, because they feared their own children would suffer academically from being placed in classrooms with their lower-income, brown neighbors. “What does that mean?” another student asked. ‘Pato’ is common slang in Puerto Rican and other Caribbean communities for ‘gay’ or ‘queer.’ It is often used offhandedly, but sometimes derogatorily. “You mean a weird person!” said the first student. As a queer educator and man of color, I heard this exchange and jumped at what I thought would be a clear-cut learning opportunity. During much of my time spent with youth at workshops and after school programs, I had come out to countless mentees and students as a means of challenging their language or their assumptions about queers in their own communities. For the youth I had worked with previously, just realizing that they knew a queer individual personally had often been enough to foster a real shift in their thinking. I thought this forward admission would be enough to spark conversation, dispel some myths and make the students challenge some of their own ideas. Instead, they freaked out. All of them gave me looks of shock and revulsion, and the ones sitting closest to me in the circle inched their chairs away from mine. I stood in front of the room and began to speak, telling the students that while I am gay and proud, my sexual identity is just one part of all the things that make me who I am. Once I had had a few short minutes to speak, the teacher opened the room up and allowed students to ask their own questions. “What made you turn gay?” asked one of the students who had been most scandalized in my original reading group. “Was anyone ever mean to you because you are gay?” asked another. “Does your family care that you are gay?” asked a third. Together, we had a long and nuanced talk about gender and sexuality, and I told the students a little bit about my own experiences as queer person in elementary and high school. Our conversation ended up centering around bullying, and as we went on many of the students bravely told their own stories about getting picked on, feeling out of place amongst their peers, and being afraid to come to school. One girl talked about being jumped by other girls in her neighborhood, and another spoke of being harassed because she wore boys’ clothes and played basketball at recess. By the end of the session, it felt as though my speaking openly about being gay had been the least significant coming out the day. The reason this experience was so powerful for me, and the reason why I would encourage all educators to come out in the classroom, was not merely because it was an opportunity for me to share my experiences as a queer man of color with youth. Certainly it challenged the notion that all low-income and brown communities are inherently homophobic, or that they are any more so than wealthy white ones. I certainly hope it was a conversation which shifted many of the kids’ perceptions and judgements, and which might one day prove significant to the handful of queer students I’m sure were in the classroom. But just as significantly as all those other points, this moment was one which proved to me the power of momentarily putting aside prescribed curriculum to address the immediate needs of a specific learning community. A conflict arose between the understandings and identities of different members of our classroom, and instead of mediating and then benignly quelling that conflict, we addressed it head-on as a community, treating it as topic for genuine and public inquiry, and an opportunity to learn more deeply about ourselves and each other. That students were able, on their own, to relate their experiences as poor, brown kids to mine as a queer, brown college student should not be surprising. For when we ask students to bring their own knowledge with them into the classroom, allow them to formulate their own connections, and model the same honesty and risk-taking on our own parts that we expect from them, whole new spaces of inquiry, creativity and exploration are suddenly opened up. Coming out as educators in our current political climate is still a very risky business. Professionalism, appropriateness and controversy are all concerns that surround the act, and the real threat of job loss which can result from challenging those boundaries is a necessary consideration. However, I would argue, these are the exact boundaries which need to be demolished to reach a more radical form of education, and a more just vision as the purpose of that education. For when we do not allow for ourselves or our students to exist as whole in the learning process, we are complicit with the compartmentalizing of education–that school is separate from home, that math is separate from art, that students are separate from teachers, that acquiring skills is separate from striving towards justice. These separations create hierarchies, ones which are lived out first in the classroom, then in the larger worlds which we carry our knowledge into. By radically challenging those orders as they manifest themselves in education, we can begin to imagine together how they might be challenged on an even larger scale. Coming out can be a great place to start. That third graders were able to engage in the most powerful and complex discussion of sexuality that I have ever witnessed proves to me that all young students carry more wisdom and bring more of a willingness for learning with them into the classroom than we ever give them credit for. They see the same world around them that we do, and sometimes have more clarity and insight into its workings than anyone else. Finding ways to honor, encourage and support them in better understanding that world is our first duty, and talking honestly about our own lives and relationships to it is an important initial step. To do this well, we need the support of colleagues, staff, peers, counselors and administrators, and we need to be organized and unionized when we don’t get it. These are just a few of the reasons for which coming out in the classroom can be a radical act, for students and educators alike. ← Identifying as Mixed-Class: Or; Why Does ‘Diversity’ Tend to Leave Out Economics?